Hi Fanny, I’m so glad you’re back! I’ve been checking your site daily, hoping for some more training tips. I am really interested in your post on increasing play drive. Do you think you can teach play drive to a 5-year-old dog who doesn’t appear interested in toys and tugging? I’m working on a utility dog title in the states and trying to motivate my dog. He does like treats and will run across the ring to get them, but not so with toys. Hoping to use some of your tips to try to develop some play drive with him. Thanks! I’m happy to see that people are actually checking the blog out daily! I promise to update more often. Great post. I have been thinking a lot about rewards lately. I really need to use more play rewards so your post is very helpful. Especially in regards to teaching tug. I think we’re making progress with the tugging 🙂 I followed your link to Susan Garretts page regarding how to begin teaching the dog to tug. And, for the past couple weeks have been working with that in the house. At first he would just take it in his mouth. Now, today when I brought it out he really grabbed hold of it and didn’t want to let go! That’s real progress for him. Our next step is to take it to the training building and see if he’s interested in it there – unless there’s a step in between that I should be doing. Please let me know if you think the next step should be something different. Thank you for this great post! I will have to think of better ways to train tug with my dog — and shape him to grab the toy further from my hand (he likes to hold the toy right next to my hand for some reason), currently he prefers food to tug but I really would find it useful to reward with play as well as food. Thanks for writing such a superb post! I too follow your website and LOVE reading your stuff and watching you train your dogs 🙂 I wish I had had this post last summer and fall when I was working on play drive with my english cocker… but I figured it out (discovered a lot of what you wrote about on my own) and I now have a crazy tugging dog with great desire and drive for toys, games, retrieving, etc. My previous dog was not very toy motivated so I used a lot of food with her. This dog was very good at training ME so I became pretty much a food-only trainer. I was determined not to let that happen with my cocker; it was hard for me but soooooo worth it. A great “side effect” of working on tugging and playing with her was that *I* loosened up and started to have way more fun training. I think my training skills have improved a lot too! Oh, I’m so glad I read this article!! 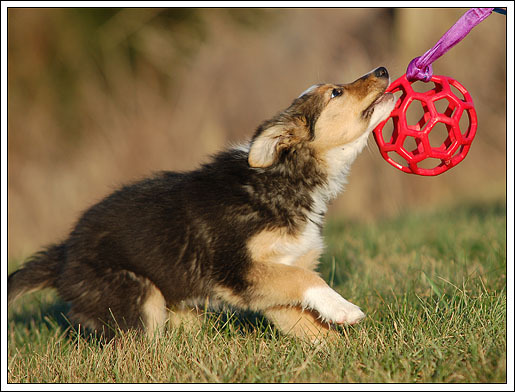 I have a mini aussie that is in beginning agility and we are in the process of using a toy drive instead of always depending on a treat. 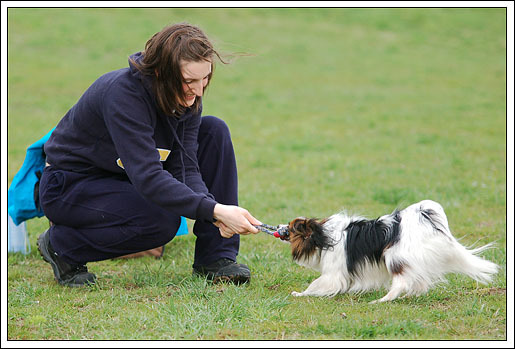 He loves to play – but not all the time on the agility field – especially when he knows I have treats. I’m taking your suggestions and will keep in mind that it takes time! Thanks so much for your suggestions and your experience! Hi Fanny,first I have to say that my english is very bad because I realy need it since leaving school. I´m working wtih my 4 years old Jack Russell Terrier in Obedience – now in germans class 2! He is rewarding by food or playing with me. 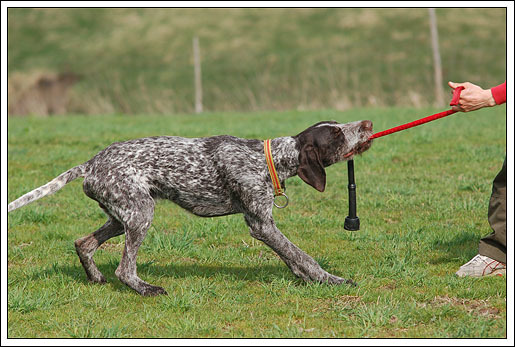 Now I´m searching for Toys that you are using with your dogs during trainingsessions. My favorite is for instance the jollyball with a rope. Did you make it on your own…? I´ve never seen it before! My name is Rebecca and i want to know Do pets have a paw preference like people have a hand preference? I’m glad you found it helpful! And it is great that she does interact with the toy in some way. Let her treat is as a mouse and make it a fun game for her to chase it. I wouldn’t care so much about her actually tugging, but more about her really enjoying the interaction with the toy and you – to begin.